Natural Smiles Are the Best! Anyone who’s known me long enough is very aware of my obsession with teeth. They’re on the top of my list of things I notice first about a person, aesthetically: how healthy, even, white/bright, and clean they are (because hopefully when people meet me they’re smiling, haha!). This also goes for my teeth; a hypocrite, I am not. I dutifully go to the dentist twice yearly, brush, floss, use mouthwash, and I even have a couple of my own dental tools! However, I drink a lot of tea and coffee, so keeping my teeth white and bright is a task that I must deal with carefully. Bleaching products are harsh, expensive, and dangerous, so I’m always looking for natural and inexpensive ways to handle the job. 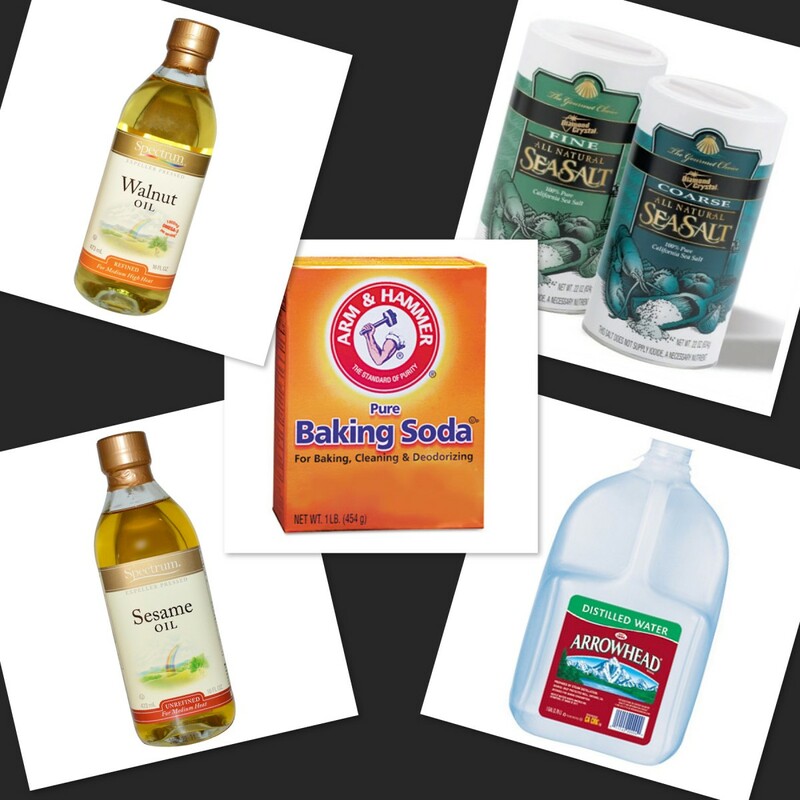 Most people brush with baking soda and hydrogen peroxide–I’ve been doing this for more years than I can count–but I want something that works better and stronger. Besides, using peroxide and baking soda long term can be too abrasive for your teeth and can ruin enamel over time. Well, my wish was some mystery god’s command! The above pic is all you need to naturally whiten your teeth without having to spend a fortune or subjecting your teeth to harsh chemicals. Unbeknownst to me, this concoction has been used for ages! Bonus: this recipe is also great for removing harmful bacteria from your mouth, which in turn strengthens your teeth and gums. See the recipe and directions for this formula below. Heat 2 cups distilled water, remove from heat and add baking soda, sea salt, and oils. Add 1 cup distilled water and mix together until ingredients are fully dissolved. Transfer mixture using a funnel into a jar with a top and store in the refrigerator until you are ready to use. Shake well before using and swish around in mouth for about 1 minute, spit out (make sure you don’t swallow any of the mixture), and brush your teeth as you normally would. Unlike many store bought rinses, this natural method contains no bleach and is perfect for removing tartar and leaves your mouth fresh and clean. Will it whiten your teeth after one treatment? No, it won’t. It will however, gradually whiten and strengthen your teeth and gums over time in a healthy, safe and natural way that won’t harm your gums and tooth enamel. This will save you a lot of money and pain in the future when you realize everyone that’s been bleaching has to buy a whole new mouth, can’t eat or drink foods due to gum erosion and intense gum sensitivity, or worse, finds out they have mouth cancer from all the chemicals and unsafe treatments. Like most things in life: slow and steady wins the race! Because I’m always looking for home remedies for all things health and beauty related, I will probably be posting more regarding keeping our smiles healthy, happy and pearly!